For over 30 years, Porsche has been offering clients the option of adding personalized details to their 911 but as the demand for bespoke automotive services continues to soar, the company is finally putting its capabilities front and center with its first Exclusive Series model. Unlike a host of Porsche’s Platinum-badged cars, this new limited edition promises much more than simply comparative rarity and a greater list of optional extras fitted as standard equipment. If you’re lucky enough to get hold of one of the 500 911 Turbo S Exclusive Series models destined for production, you’ll be able to claim ownership of the most powerful production Porsche Turbo ever built. Its 3.8-liter flat six serves up 750Nm of torque, and 607hp (up from 580hp on the standard model) and this extra grunt equates to a 2.9-second 0-100km/h dash. It will also hit 200km/h within 9.6 seconds and eventually top out at 330km/h. Yet fuel economy remains unchanged. Somehow this supercar can manage 9.1l/100km on the combined cycle. Thankfully, whether pushed hard or not, the car will stay glued to the road thanks to permanent all-wheel drive and four-wheel steering. 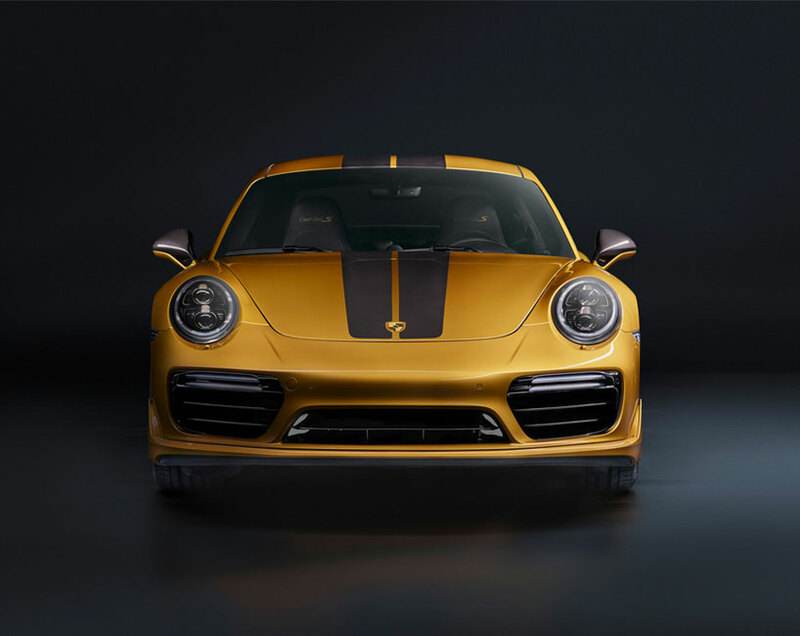 But even when standing still this car will turn heads thanks to its unique paint finish — Golden Yellow Metallic — plus the contrasting naked carbon fiber exterior elements, including carbon fiber exposed racing stripes. This contrasting color combination continues throughout the cabin where the 18-way adjustable seats are double-wrapped in perforated leather, one layer yellow, the other black. There’s also contrasting yellow stitching in the headrests and a double racing stripe, also in yellow, running through the headliner. Another first for this car is the inclusion on the options list of a matching Porsche Chronograph watch built from the same materials and using the same design details and paint scheme. For example, its face is formed from carbon fiber and the rotor is the same shape and finish as the car’s alloy wheels. Like the car, it is limited to 500 examples, and will retail for €9,950. The final touch is a set of matching luggage designed specifically for the car. Consisting of two holdalls, a day bag and a suit bag, it will add a further €5474 to the car’s €259,992 base price. As well as announcing the new car, Porsche on Thursday also confirmed that its in-house Porsche Exclusive workshop, that usually carries out custom work for clients, is being spun out into a fully-fledged service called Porsche Exclusive Manufaktur, complete with dedicated headquarters in Zuffenhausen. The move brings the company up to speed with its most direct competitors — Ferrari, Lamborghini, Aston Martin and McLaren — each of whom already has a dedicated special operations and bespoke services business for their most discerning clients.